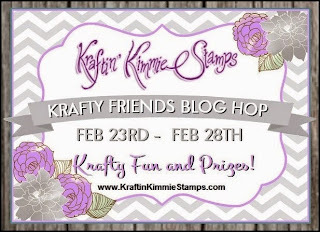 I'm so excited to be part of the first ever Krafty Friends Blog Hop featuring Kraftin' Kimmie Stamps' Krafty Friends! The blog hop is filled with creations by customers, design team members and friends of KKS and we're so excited to share some of our creations! Feel free to start the hop from the beginning at the Kraftin' Kimmie Stamps Blog. Then hop around and check out all the fabulous designs! Be sure to leave a comment at each stop because there will be prizes and giveaways to some random commenters! Not only can you comment to win, we'd love to have you JOIN the blog hop by posting your own desing!! Just post a new creation featuring a Kraftin' Kimmie Stamp and link it up to the main blog post and you'll not only be a part of this fun hop, but you'll be entered to WIN more goodies!! You have until February 28th! For my card I used Tinkerbell. I colored her using Spectrum Noir Pens. To create my card I have used the colors navy blue, pink and aqua. The border punch I used is an eyelet lace border punch. The embossing is done using a swirl embossing folder. To create the flower I layered 5 paper flowers and added an aqua gem to the center. I've added diamond stickles to her wings, eyebrows and the butterflies. I hope you like my card and I hope you will join us for the blog hop!! Tink looks so cute in pink!! Such a fabulous color combo and a beautifully made card! So glad you shared it with us in the first ever Krafty Friends Blog Hop! Ahhhh Tink...one of my favourite KKS ! Love your card, the colours and her glittery wings. Love the soft colors and design! Beautiful! Very pretty colours and a wonderful design to this card. The diamond stickles for the wings was a FAB choice!! Great card! I love the soft colors you used and especially love her sparkly wings! So Sweet!! She's so adorable and I LOVE her sparkly wings. Wow! You used so many wonderful techniques to create this beautiful card! How clever to cut a section of swirl-embossed paper to add a bit of dimension to the background. I also love your attention to detail such as the glittery wings. Great coloring skills and those butterflies really give this card a great sense of movement. Excellent work and I'm so glad you shared your skills with us for this week's Simon Says Stamp Monday Challenge! Adoable and sassy fairy and I love the diamond stickles you added to her wings. Thanks for sharing on the Open-Minded Crafting Fun Challenge #30 - Up In The Air. Oh she is so adorable. Pretty card. Love the color palette and her wings! Thanks for sharing it at The Pink Elephant Challenge! Lovely! I love the iridescent glitterful wings, and all the sugar dots! Love the colors of the card and her glittery wings! Thanks for playing along at Open-Minded Crafting Fun Challenges! !